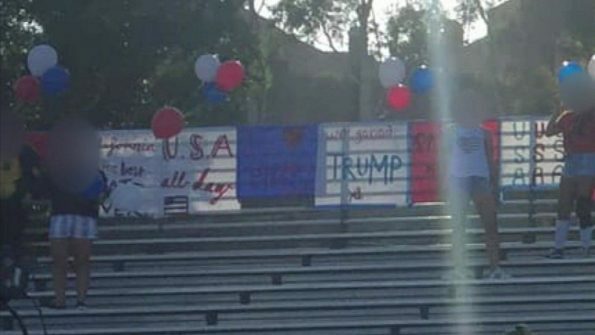 The reported theme of the night on Friday at Aliso Niguel High School was “Red, White and Blue,” to commemorate 9/11, but Principal Jeff Bishop stated some of the students used the patriotic theme to discriminate against people instead. “The disputed incidents occurred at Friday night’s contest between Aliso Niguel and Santa Ana high schools, during which Santa Ana Principal Jeff Bishop became upset by what he saw as racially tinged intimidation by Aliso Niguel students. In Facebook posts after the game, Bishop described signs expressing support for President Trump and proclaiming “We love White” and “Build the Wall,” a reference to Trump’s pledge to build a barrier along the border between the United States and Mexico. Bishop also stated he heard chants of “USA, USA,” as if the home team’s players were Americans playing another country. He plans to address the issue at a future school board meeting.